Move and match bricks to unravel the mysteries of ancient hieroglyphs that will help you restore the glorious pyramids. 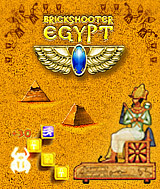 Brickshooter Egypt is a totally new brain-teasing puzzle experience across more than 60 captivating levels. The difficulty increases with your 2nd and 3rd replay and provides for a total of 180 exciting levels in all. If the stunning Egyptian themed graphics and soundtrack don´t hook you, the gameplay will. Unlock the secrets of the pharaohs today. Comments: This game really make you think. It gets hard, but I play without a time limit and try to really focus on what I am doing. Comments: I really love it. It teach you not to give up just keep trying and you will succeed. I love the difficulty of it. When you finish you feel you have accomplish something. Its a great feeling!!! !